I had the best idea for my mom for Mother's Day this year. I have been giddy for weeks as I've put it all together. 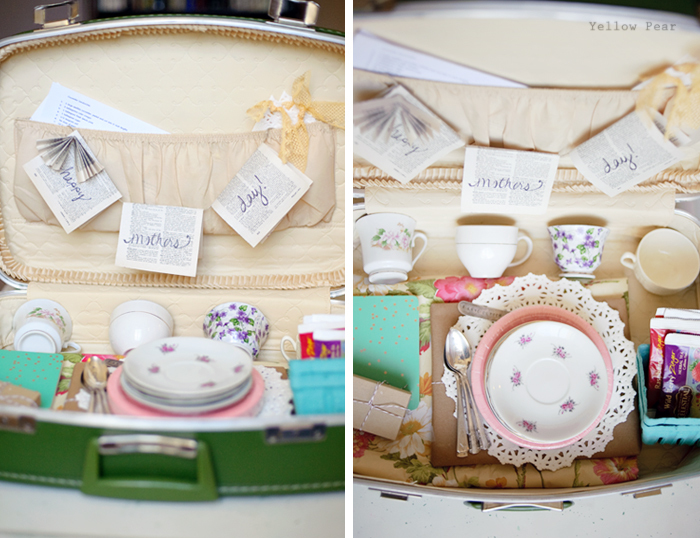 I combined a few of her favorite things including pretty dishes, floral, books, Jane Austen, and tea parties and put together a Tea Party Kit, housed in a vintage green suitcase. 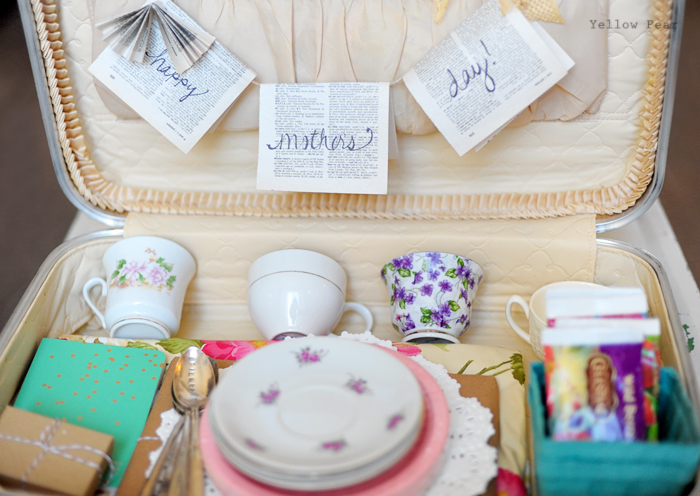 I added thrifted teacups/saucers, paper doilies, pink paper plates for goodies, a floral tablecloth, and some vintage silver spoons. 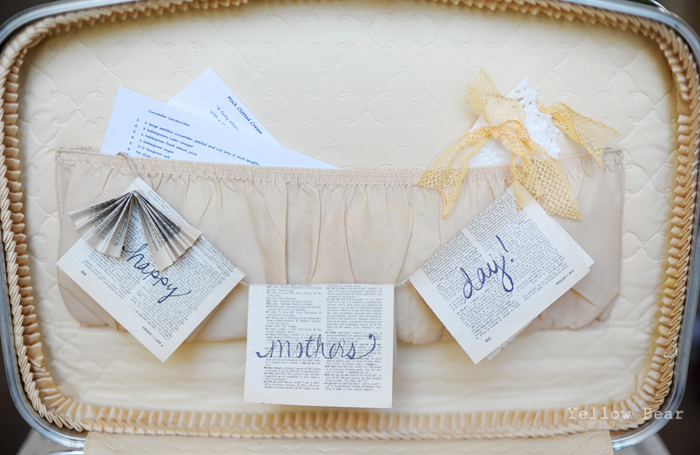 I made a Mother's Day banner from book pages that hangs when the suitcase is open and then slipped recipes, notes from the kids, Jane Austen quotes and a doily/lace banner into the top pocket. 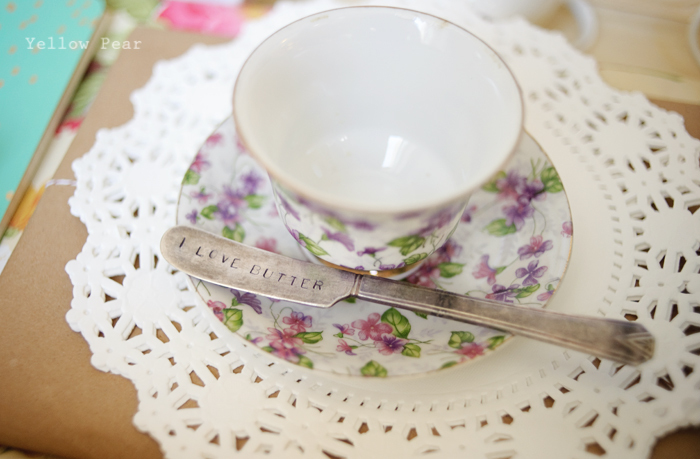 I put my silver stamping to good use again and stamped "I Love Butter" onto a silver butter knife. My mother and Julia Childs are of one mind when it comes to butter usage. 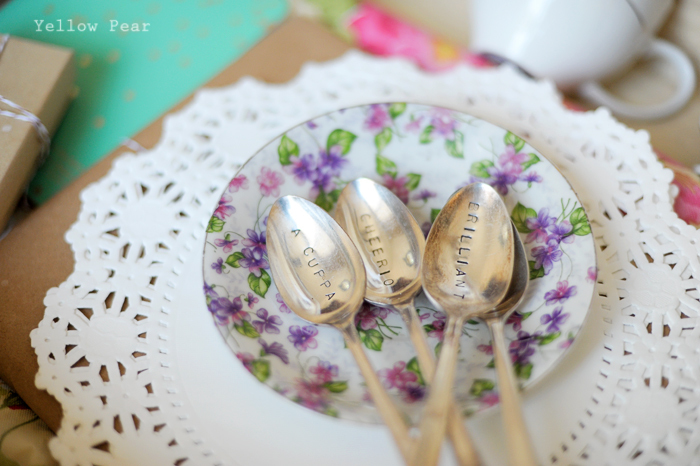 I also stamped four teaspoons with tea-type words. If there is such a thing. 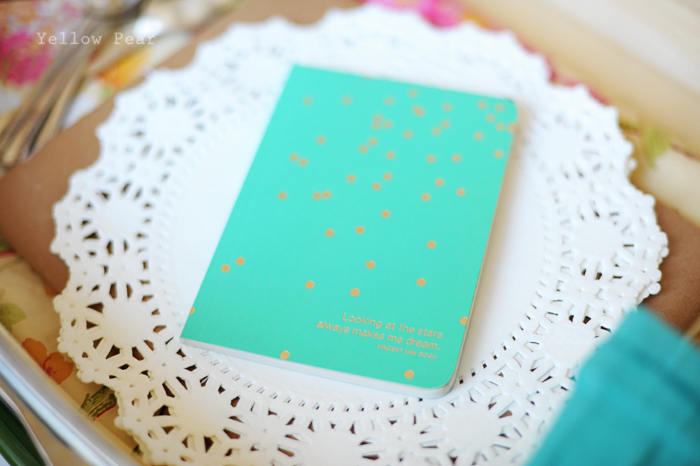 I wrapped up a couple of surprises, like a vintage entertaining/cook book and a small journal. 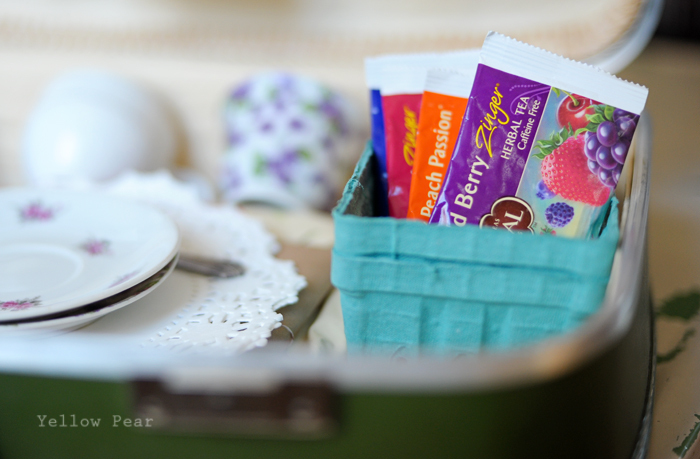 And finally, I tucked some of her favorite herbal teas and two berry baskets into a corner. Now all she needs to do is add water (plus three friends, a table, a pretty hat and some goodies). 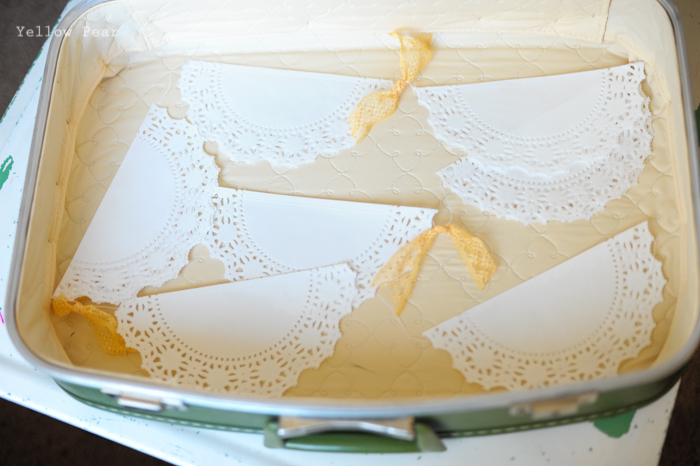 *Sigh* I think I need to have a tea party. 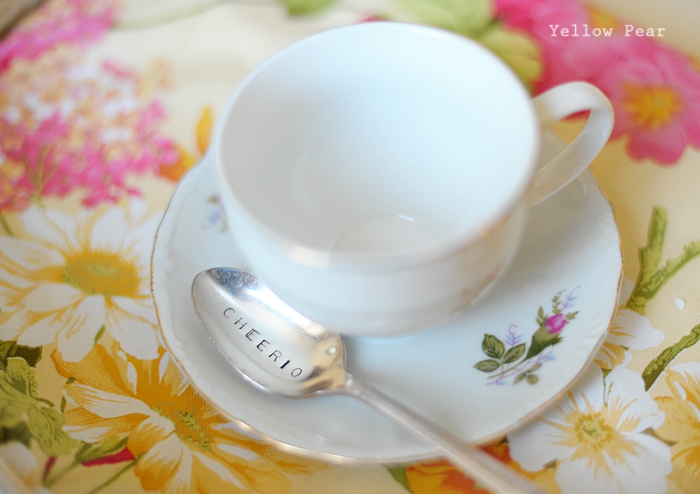 I shall be searching for my own set of vintage teacups/saucers. This looks PERFECT, Lou! Ahhhh.... The simple pleasures of life, ya know?? Let's do have a tea party again. Just us. K? We do need another tea party. It was so nice! And I do enjoy simple pleasures! Oh man, so dang cute! I'm taking the girls to a real tea party in San Fran this summer. They are so excited. 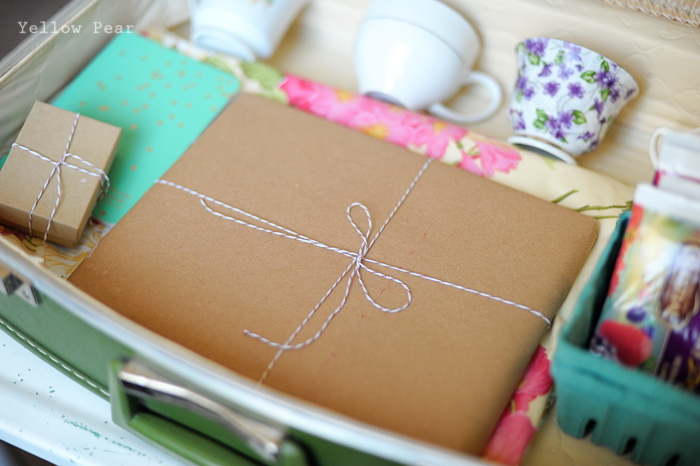 Wow, this tea party kit is fabulous. I would love to have this for upcoming birthday bash of my daughter. She loves tea parties so I would be hosting the bash at one of the best garden party venues in Los Angeles.